Kismayo (Somali: Kismaayo; Arabic: كيسمايو‎, Kīsmāyū) is a port city in the southern Lower Juba (Jubbada Hoose) province of Somalia. It is the commercial capital of the autonomous Jubaland region. The city is situated 528 kilometres (328 miles) southwest of Mogadishu, near the mouth of the Jubba River, where the waters empty into the Somali Sea. According to the UNDP, the city of Kismayo has a population of around 89,333 in 2005. During the Middle Ages, Kismayo and its surrounding area was part of the Ajuran Empire that governed much of southern Somalia and eastern Ethiopia, with its domain extending from Hobyo in the north, to Qelafo in the west, to Kismayo in the south. 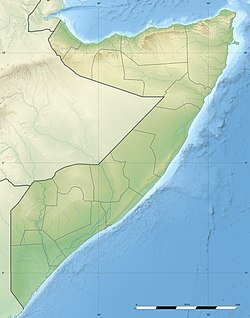 In the early modern period, Kismayo was ruled by the Geledi Sultanate and by the later 1800s, the Boqow dynasty. The kingdom was eventually incorporated into Italian Somaliland in 1910 after the death of the last sultan, Osman Ahmed. After independence in 1960, the city was made the center of the official Kismayo District. Kismayo was later the site of numerous battles during the civil war. In late 2006, Islamist militants gained control of most of the city. To reclaim possession of the territory, a new autonomous regional administration dubbed Azania was announced in 2010 and formalized in 2011. In September 2012, the Somali National Army and AMISOM troops re-captured the city from the Al-Shabaab insurgents. The Juba Interim Administration was subsequently officially established and recognized in 2013. During antiquity. Kismayo was part of the Somali city-states that in engaged in a lucrative trade network connecting Somali merchants with Phoenicia, Ptolemic Egypt, Greece, Parthian Persia, Saba, Nabataea and the Roman Empire. Somali sailors used the ancient Somali maritime vessel known as the beden to transport their cargo. Flag of the Ajuran Sultanate, an influential Somali empire that held sway over Kismayo and the larger Jubaland region during the Middle Ages. The Kismayo area was originally a small fishing settlement. During the Middle Ages, the region came under the rule of the influential Ajuran Sultanate, which utilized the Jubba River for its plantations. After the collapse of this polity, the House of Gobroon was established and the Sultanate of the Geledi held sway over the area. The dynasty reached its apex under the successive reigns of Sultan Yusuf Mahamud Ibrahim, who successfully consolidated Gobroon power during the Bardera wars, and Sultan Ahmed Yusuf, who forced regional powers such as the Omani Empire to submit tribute. In the latter half of the 19th century, Somali pastoralists from the northern Harti Darod clan settled in Kismayo's interior. By the turn of the 20th century, they had established a southern Harti royal house in Kismayo with the Boqow dynasty that with Huseen Boqow continued through both the British and Italian colonial period although its influence declined upon Somali independence. The city subsequently evolved into a major hub of the livestock trade. The main Harti representatives to establish themselves in Kismayo were Majeerteen traders from the northeastern Ras Hafun promontory, who were referred to as Hafuuni. In the first two decades of the 20th century, during Mohammed Abdullah Hassan's ("Mad Mullah") Dervish resistance, members of the Dhulbahante Harti sub-clan followed suit. From 1836 until 1861, Kismayo and other parts of Jubaland were claimed by the Sultanate of Muscat (now in Oman), when the new Sultanate of Zanzibar was split from Muscat and Oman and given control of its East African territories. Pact between the Somali authorities from the Harti and Ogaden clans (1925). On 7 November 1890, Zanzibar became a British protectorate, and on 1 July 1895, the Sultanate ceded all of its coastal possessions in continental East Africa to Britain. Together with the Zanzibar Sultanate's other former possessions in the area, Jubaland became part of the British East Africa colony. The ascendancy of the Harti merchant community crystallized under the British administration. They became the first Somali employees of the state, establishing themselves as an educated, urban professional class. In 1925 local authorities from the Harti and Ogaden Somali clans reached an agreement, with the British acting as enforcer. The signatories each had different accounts of the agreed to partition. According to the Ogaden, the pact gave their Sultan Ahmed Magan control of Jubaland at large. The Harti maintained that the agreement stipulated that the part of the city south of the Liboi–Kismayo road would remain under their control, while the Ogaden, and its Mohamed Zubeir subdivision in particular, would administer the area to the north of this. The pact also allowed the Mohamed Zubeir access to the port. The territory was subsequently ceded to Italy, purportedly as a reward for the Italians having joined the Allies in World War I, and had a brief existence as the Italian colony of 'Trans-Juba (Oltre Giuba). The Italians subsequently referred to the city as Chisimaio. Kismayo and the northern half of the Jubaland region were then incorporated into neighboring Italian Somaliland on 30 June 1926. The colony had a total area of 87,000 km² (33,000 sq mi), with a population of 120,000 inhabitants. Britain retained control of the southern half of the partitioned Jubaland territory, which was later called the Northern Frontier District (NFD). Under Italian administration, the Harti retained their position as the professional elite. After independence in 1960 and the establishment of a civilian administration, the 1968 parliamentary elections saw Harti MPs win all four of the seats earmarked for Kismayo. Following the breakdown of central authority that accompanied the civil war in 1991, various local militias fought for control of the city, including supporters of Mohammed Said Hersi ("General Morgan"), and Col. Barre Adan Shire Hiiraale Somali National Front (SNF), later on known as the Juba Valley Alliance (JVA). As well of Col. Omar Jess' Somali Patriotic Movement (SPM). In March 1993, a United States Marine amphibious group arrived in the city in an attempt to keep the peace as part of the United Nations intervention in Somalia. By December 1993, General Morgan's troops controlled Kismayo, despite the presence of peacekeepers. The last UN troops left the city in December 1994. The Kismayo panorama just prior to the civil war. General Morgan briefly declared Jubaland independent on September 3, 1998. Political opponents of his subsequently united as the Allied Somali Forces (ASF), seizing control of Kismayo by June of the following year. Led by Colonel Barre Adan Shire Hiiraale, the ASF administration renamed itself the Juba Valley Alliance in 2001. On June 18 of that year, an 11-member interclan council decided to ally the JVA with the newly forming Transitional Federal Government. In 2006 the Islamic Courts Union (ICU), an Islamist organization, fought with Jubaland's inhabitants of the state the Darod Marehan (JVA). And invaded other parts of southern Somalia and promptly imposed Shari'a law. The Transitional Federal Government sought to re‑establish its authority, and, with the assistance of Ethiopian troops, African Union peacekeepers and air support by the United States, managed to drive out the rival ICU and solidify its rule. On January 8, 2007, as the Battle of Ras Kamboni raged just south of Kismayo, the TFG relocated from its interim location in Baidoa to the nation's capital, Mogadishu. This marked the first time since the fall of the Siad Barre regime in 1991 that the federal government controlled most of the country. Following this defeat, the Islamic Courts Union splintered into several different factions. Some of the more radical elements, including Al‑Shabaab, regrouped to continue their insurgency against the TFG and oppose the Ethiopian military's presence in Somalia. Throughout 2007 and 2008, Al‑Shabaab scored military victories, seizing control of key towns and ports in both central and southern Somalia. By January 2009, Al‑Shabaab and other militias had managed to force the Ethiopian troops to retreat, leaving behind an under-equipped African Union peacekeeping force to assist the Transitional Federal Government's troops. Huseen Boqow of the Boqow dynasty. In September 2012, the Somali Army and AMISOM troops re-captured the city from the Al-Shabaab insurgents during the Battle of Kismayo (2012). Kismayo is located in the fertile Juba Valley in southeastern Somalia, on the Indian Ocean coast. Nearby settlements include to the northeast Xamareyso (5.0 nm), to the north Dalxiiska (1.3 nm), to the northwest Qeyla Dheere (6.4 nm), to the west Saamogia (0.9 nm), to the southwest Iach Bulle (10.0 nm), and to the south Qandal (6.5 nm). The largest cities in the country most proximate to Kismayo are Jamaame (52 km), Jilib (97 km), and Merca (337 km). Kismayo has a hot semi-arid climate (Köppen climate classification BSh). Weather is hot year-round, with seasonal monsoon winds and irregular rainfall with recurring droughts. The gu rains, also known as the Southwest Monsoons, begin in April and last until July producing significant fresh water and allowing lush vegetation to grow. The gu season is followed by the xagaa (hagaa) dry season. A new municipal district administration was established on 6 September 2008. Its members reportedly represented the ICU and Al‑Shabaab (three members each) in addition to a local clan (one member) which had played a part in the military assault. Representatives of the Islamic Courts Union questioned the legitimacy of the authority. On 1 October 2009, Al Shabaab took full control of the city, after Col. Barre Adan Shire Hiiraale self proclaim President of the (JVA) Jubaland state. And Sheikh Ahmed Madobe, a senior commander of Ras Kamboni Brigade (then a part of Hizbul Islam), challenged Al‑Shabaab's control. With the subsequent ouster of the Al-Shabaab rebels in September 2012, the Somali government began preparing mediations between the city's various stakeholders in order to establish an inclusive local administration. On 28 August 2013, the autonomous Jubaland administration signed a national reconciliation agreement in Addis Ababa with the federal government. Endorsed by the federal State Minister for the Presidency Farah Abdulkadir on behalf of President Hassan Sheikh Mohamud, the pact was brokered by the Foreign Ministry of Ethiopia and came after protracted bilateral talks. Under the terms of the agreement, Jubaland is administered for a two-year period by a Juba Interim Administration and led by the region's incumbent president, Ahmed Mohamed Islam. The regional president serves as the chairperson of a new Executive Council, to which he appoints three deputies. Additionally, the agreement includes the integration of Jubaland's military forces under the central command of the Somali National Army (SNA), and stipulates that the Juba Interim Administration will command the regional police. Main schools and sites in Kismayo. Institutions of higher learning in the city include Kismayo University (KU). Established in August 2005, it is situated about 1 km north, along the Kismayo–Mogadishu main road. Kismayo is the market center and commercial hub autonomous jubbaland region. Bank with a presence in Kismayo include salama bank and other many money remittance business. In October 2008, the daily labor rate was estimated at 157,500 Somali shillings (approximately $4.50), up from 52,000 shillings (approximately $2.21) in January 2008, while kilogram of red rice rose from 14,170 (approximately $0.61) to 46,000 (approximately $1.31). A liter of diesel cost 43,000 shillings (approximately $1.23) and a camel costs over 15 million shillings (approximately $435). Total cereal production as of 2008 was estimated to be 780MT. Before the war, there were a meat-tinning factory, as well as a tannery, and a modern fish factory. There were also two sugar refineries, one at Jowhar and another situated near Jilib. As of January 2007, the market was bustling, although the city's infrastructure had incurred considerable damage. Kismayo's air transportation needs are served by Kismayo Airport, which is situated about 10 km from the city. It was formerly a Somali Air Force training base. Following the outbreak of the civil war, the airport was closed down for a period of time and its infrastructure was significantly damaged. However, the facility was reopened in October 2008 by the Islamic Courts Union after undergoing some renovations. That same year, the airport was also renamed after Imam Ahmed Gurey, a 16th‑century Somali military leader. The Kismayo Airport was officially brought under the Juba Interim Administration in August 2013. Per agreement, management of the facility was scheduled to be transferred to the Federal Government after a period of six months. Revenues and resources generated from the airport will also be earmarked for Jubaland's service delivery and security sectors as well as local institutional development. Three main thoroughfares connect Kismayo to other major areas in the country. The 600 km Highway 3 runs the length of the Juba Valley. Starting in Beled Hawo, it goes through Garbaharey, Bardera and Buale before finally reaching Kismayo. A paved 528 km freeway links the capital Mogadishu with Kismayo. A third highway extends northwest from Kismayo to Afmadow, then turns toward Dhobley in the eastern part of the Gedo region. In January 2015, the Interim Juba Administration launched a transport beautification and cleaning campaign in Kismayo. Part of a broader urbanization drive, the initiative includes the clearing of clogged streets and lanes, razing of illegal buildings therein, and further development of the municipal road network. Kismayo's large docks are situated on a peninsula on the Indian Ocean coast. Formerly one of the Bajuni Islands, the peninsula was subsequently connected by a narrow causeway when the modern Port of Kismayo was built in 1964 with U.S. assistance. The port served as a base for the Somali Navy as well as the Soviet Navy after the military coup in Somalia in 1969. Somalia and the United States jointly refurbished the port in 1984 after significant wear to the 2,070-foot-long (630 m) four-berth, marginal wharf at the harbor required major renovations to maintain operations. The Port of Kismayo was officially brought under the Juba Interim Administration in August 2013. Per agreement, management of the facility was scheduled to be transferred to the Somali Federal Government after a period of six months. Revenues and resources generated from the seaport will, like the Kismayo airport, be earmarked for Jubaland's service delivery and security sectors as well as local institutional development. ^ a b c Lee V. Cassanelli, The shaping of Somali society: reconstructing the history of a pastoral people, 1600–1900, (University of Pennsylvania Press: 1982), p.102. ^ Cassanelli, Lee Vincent (1973). The Benaadir Past: Essays in Southern Somali History. University Microfilms International. p. 149. ^ a b "Somali, AMISOM forces on the outskirts of Kismayo" (PDF). AMISOM. Retrieved 30 July 2014. ^ a b c d "Somalia: Jubaland gains recognition after intense bilateral talks in Ethiopia". Garowe Online. 28 August 2013. Retrieved 11 September 2013. ^ Osman, Mohamed Amin AH (1993). Somalia, proposals for the future. SPM. pp. 1–10. ^ "Ethiopian Invasion of Somalia". Globalpolicy.org. 2007-08-14. Retrieved 2010-06-27. ^ "Kismaayo, Somalia". Falling Rain. Retrieved 7 June 2013. 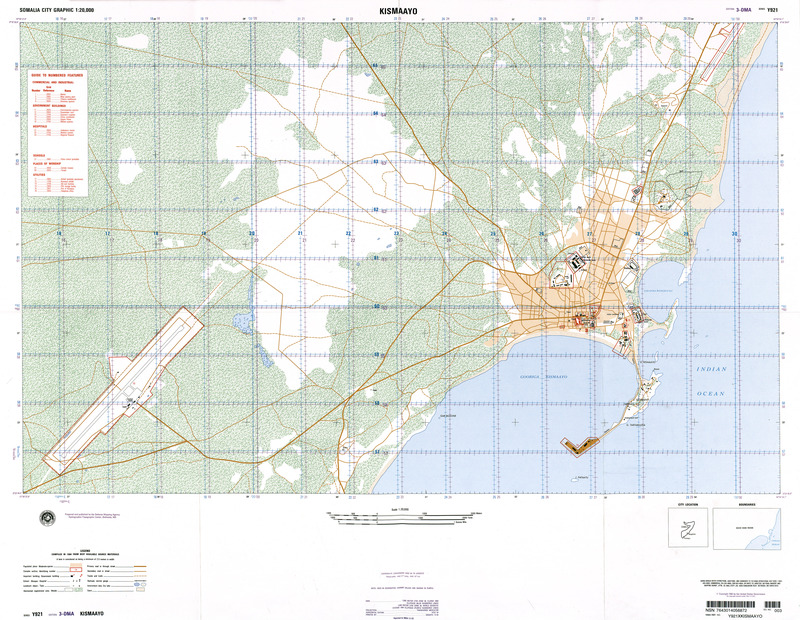 ^ "Kismayo (Chisimayu, Kismayu)". Weather-Forecast. Retrieved 7 June 2013. ^ "Klimatafel von Chisimaio (Kismayu) / Somalia" (PDF). Baseline climate means (1961-1990) from stations all over the world (in German). Deutscher Wetterdienst. Retrieved 24 October 2016. ^ "Long term mean monthly sunshine fraction in Somalia". Food and Agriculture Organization. Retrieved 4 November 2016. ^ Garowe Online 2008, 'Somalia's Islamists appoint Kismayo administration' Archived 2008-09-16 at the Wayback Machine, Garowe Online, 6 September. Retrieved on 7 September 2008. ^ Garowe Online, 'Al Shabaab seize control of Kismayo after battle' Archived 2009-10-08 at the Wayback Machine, Garowe Online, 1 October. Retrieved on 4 October 2009. ^ "African troops enter Somali port of Kismayo". AFP. 2 October 2012. Retrieved 2 October 2012. ^ Wendoson, Abera. "Somalia gives recognition to Jubaland interim administration". Ethiopian Herald. Archived from the original on 11 September 2013. Retrieved 11 September 2013. ^ "OGĀDĒN". Encyclopédie de l’Islam. Retrieved 2019-04-13. ^ Gettleman, Jeffrey (8 January 2007). "Islamists Out, Somalia Tries to Rise From Chaos". New York Times. Retrieved 7 September 2012. ^ "The police commission of Kismayo plans to bulldoze the illegal buildings along the main roads". Goobjoog. 16 January 2015. Retrieved 18 January 2015. Wikivoyage has a travel guide for Kismayo.